Do you need to protect your belongings without building a permanent structure? 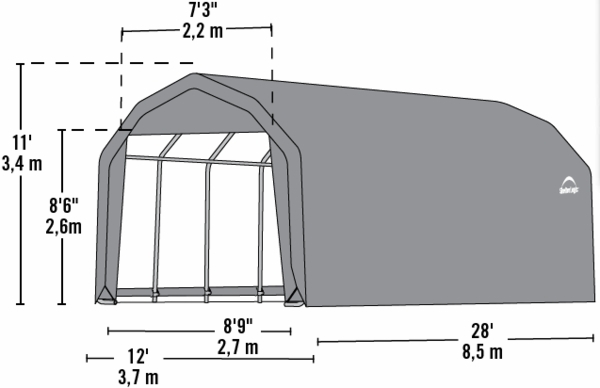 This portable homestead barn garage sets up quickly and typically requires no building permit. The package includes everything you need to assemble the garage: a sturdy steel frame, a fitted cover, doors, vents, steel foot plates, and easy step by step directions. The high grade steel frame is field tested to withstand all but the most rigorous weather conditions, and it is treated with a power-coated finish to eliminate any rust, weathering, chipping, and peeling. The slip fit connectors and swedged tubing allow easy assembly, while the wide-based foot pads on every leg ensure a dependable base and easy access to secure anchor points. The fitted one-piece cover is totally tear resistant, heat bonded, and UV treated with added fade blockers, anti-aging, and anti-fungal agents, providing quality protection for years to come. Are the 2" pipe framing square or round? The manufacturer states that the unit's poles are round. old granddaughter. Installed it on a strong treated deck. Would recommend an older helper on this 12x28x11,.put it up in one day, strong, looks like new for the past 1&1/2 years thru this second Ohio winter. 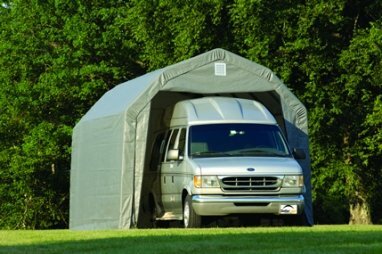 Would recommend this shelter logic product. ConsInstalled my own overhead garage door for easy opening.